Sessions typically take place at my practice at Fulcrum House at the top of Whiteladies Road. 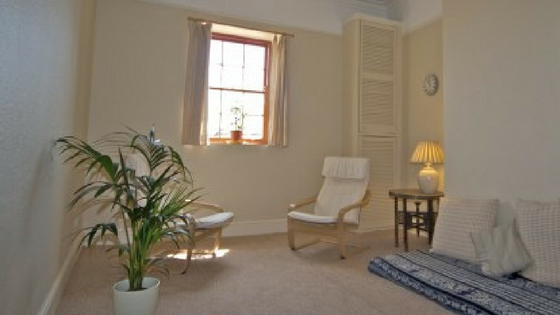 There are several therapy rooms in Fulcrum house – all peacefully arranged. I work in a way that integrates the practice of counselling and coaching. This combined approach is tailored to your specific needs, issues and goals. This approach is effective for working through past issues and deep rooted patterns that have been preventing you from realising your potential and achieving your goals. The aim is to create sustainable life changes that empower you to be able to make conscious decisions, while having the confidence to act upon them. I work in a warm, empathic and non-judgmental way that creates a safe confidential space to explore the issues you are struggling with. I work with interactions and relationships. I seek to understand the ways in which you relate to others within your social systems, e.g. intimate relationships, families, work environment etc, and how you experience those interactions. We delve in to the past only if it significantly helps you to understand your thoughts, feelings, beliefs and habits you are largely unaware of, that have caused you to remain stuck. I work in both a time-limited way, that could be up to 12 sessions; and ongoing work, usually 1 year and beyond. Time-limited sessions are weekly and ongoing sessions can be weekly or fortnightly. I am rigorous about checking in with my own process, being open and objective about how the work is progressing and being willing to make changes where necessary. My focus is on health not illness. I attempt to not pathologise behaviours, but instead view issues or problems in living as part of the human condition, not as ‘good’ or ‘bad’. I believe that people have the potential for personal growth and creativity, if provided with the right conditions. I provide ‘tools’ that help enable you to improve your quality of life and move towards fulfilling your potential.